The potential of technology is breathtaking – there’s no denying that. But ask most constituents where they want their tax dollars spent, and technology investments inside of government offices won’t top the list. Instead, they’d want smoother roads, shorter lines and safer communities – more tangible productions of government. Governments need new technologies to provide quality services and amenities to citizens, but they’re often caught in a lasso of legacy applications and prohibitive costs. To find out how agencies can translate IT into showpiece results, GovLoop interviewed Bob Benstead, Vice President of Business Development and Strategy, Infor Public Sector. “The government always has to know that technology has to serve or improve your service with citizens,” Benstead said. To reach and better serve citizens, governments cannot afford to spend IT budgets on band-aids or temporary fixes for legacy technologies. They need something that will dramatically alter the way they deliver services. An enabler allows governments to incorporate front-facing emerging technologies that actively contribute to mission objectives. Therefore, the benefits are immediately visible to agency employees and customers. For example, governments can incorporate intelligence and predictive capabilities into call centers to collect case information and respond to simple questions, freeing up employees to deal with more complex and important matters. Such technologies can reduce costs for agencies and eliminate wait times and inconsistent experiences for constituents on the other end. 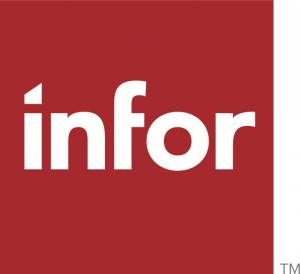 These capabilities are enabled by a purpose-built cloud suite, which Infor offers. Managing the cloud as Software- as-a-Service through Infor can prepare agencies for what’s next – by offering Internet of Things (IoT) asset capabilities, predictive tools and artificial intelligence. In real time, this means agencies can mitigate familiar risks in government and expand the reach of services. For example, in special event management, a uniform platform for permitting and licensing expedites the process for contractors and agencies. Then, governments can use drones, IoT sensors and AI in conjunction to mitigate the overcrowding of public spaces, ensuring a safer and manageable experience. From there, governments can go through a checklist to ensure they’re providing the right experiences. That starts with making sure that the ultimate goal of IT modernization is well defined. Next, Benstead said, agencies can take steps to ensure that technology is useful and cost-effective in government. “Avoid bright lights,” he urged, and prioritize gains first, however small they may be. A successful project can provide a template for public sector improvement that will help garner buy-in from all corners going forward. 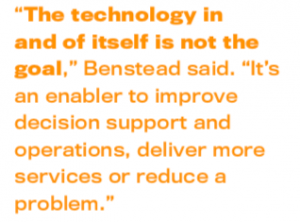 “The technology in and of itself is not the goal,” — great quote from Bob Benstead — this is exactly the mindset that government (and the private sector) needs when considering new tech.